Disinfection can be understood as a measure to eliminate viable and infectious agents and to interrupt infection chains. Disinfection can be performed by means of heat or radiation (physical or thermal disinfection) or through chemical agents (chemical disinfection). Chemical disinfectants dissolve components of pathogens or inhibit their metabolism. Their routine application in risk areas is indispensable to protect people’s health. Disinfectants are used at many points, such as working surfaces, flooring, furnishings, medical devices and last but not least for the disinfection of hands and the skin. Beside the intended and desired effect the application of disinfectants pose certain threats for human health and the environment. These risks are based on substance-inherent properties which are classified according to the CLP Regulation. The CLP Regulation 1272/2008 is based on the United Nations’ Globally Harmonised System (GHS) and serves for the classification and labelling of hazardous substances. Classification means that hazardous properties such as flammable, toxic, corrosive etc. are assigned to a substance or a product on the basis of investigations and experience. For more than 4000 substances the classification is harmonised which means that the classification is included in Annex VI of CLP Regulation and is mandatory within the EU. However at the moment the classification criteria of the CLP Regulation do not cover all dangerous properties, so for instance not endocrine activity. A study commissioned by the European Commission shows that from 105 biocidal active substances with a harmonised classification 36 are classified as toxic or very toxic, 30 substances are classified as skin- and/or respiratory sensitizers, 24 substances as corrosive, 16 substances as carcinogenic, mutagenic or toxic for reproduction, 6 substances are classified as toxic after repeated or prolonged exposure, 51 substances as very toxic to aquatic organisms + may cause long-term adverse effects in the aquatic environment and 7 substances are listed as category 1 endocrine disruptors. This illustrates that biocidal active substances – and these form the basis of disinfectants – to a considerable extent are health-threatening and/or harmful to the environment. To keep the risk of disinfectant application as small as possible one of the following approaches can be taken: i) reduce quantities to optimal levels; ii) reduce or avoid exposures by application; iii) reduce or avoid dangerous substances. Staff training concerning appropriate application (compliance to dosage instructions and proper disposal) and operating conditions (protective clothing, gloves, ventilation) can help to reduce threats but cannot exclude them completely since a certain exposure to humans (e.g. via inhalation) and the environment will remain even in case of compliance with all rules. Additionally everyday experience shows that accidents and application errors appear. For instance it is not unusual that gloves have leakages. Therefore it is by far the safest and most elegant method to avoid the use of substances with allergenic, mutagenic, repro-toxic and carcinogenic properties and additionally those which are highly hazardous to the aquatic environment. Reduction and avoidance of hazardous agents in the product can be rightly claimed as the best solution to minimise risks in the application of disinfectants. The WIDES database facilitates the selection of products which are sufficiently efficient for a specific application whilst minimising hazardous agents. The WIDES database has been developed by the Vienna City Administration as a user-friendly information system which compiles and analyses the hazards of commercially available disinfectants. WIDES enables purchasing departments and those responsible for sanitation in healthcare settings to compare products with a mouse click and to choose those that pose less risks to hospital staff, patients and the environment – a procedure known as “substitution”. The WIDES database has been developed in collaboration with international experts in occupational health and environmental protection. The bureau for chemical engineering TB-Klade is substantially involved in this process and prepares and edits data entries, substance assessments as well as the assessment scheme as such. 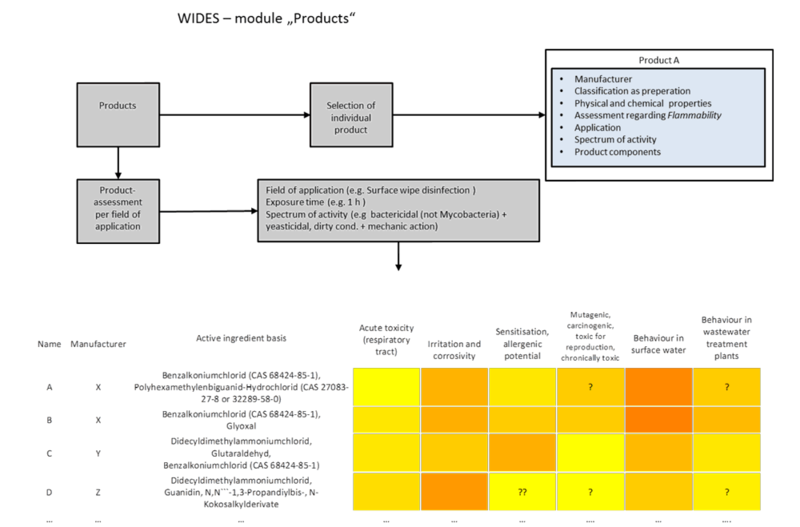 The assessment scheme of WIDES consists of the substance assessment and the product assessment. The following chapters which are excerpts from the PDF document “Introduction to the assessment framework” which can be downloaded from the WIDES webpage should help to understand the assessment scheme. In the WIDES substances are assessed in respect to their adverse impacts on human health and the environment. According to the European CLP regulation classification is displaying and communicating such threats by means of a set of hazard statements (H-statements). The WIDES assessment investigates and “translates” substance specific H-statements into assessment numbers. Assessment rules determine how the H-statements are assigned to hazard categories and to the assessment numbers. The assessment numbers are associated with a colour code indicating the severity of the hazard potential in shades from pale yellow to deep red. Figure 1 shows the allocation of the H-statements to hazard categories and assessment numbers. Antimicrobial agents and dangerous ingredients are assessed in all six hazard categories. Each hazard category is assigned with the assessment number derived from the most hazardous H-statement. To exclude hazards the WIDES assessment goes beyond classification and checks additional data. This is done since the absence of H-statements alone is not sufficient to exclude hazards because a classification does not necessarily rely on a complete data set. Data from REACH dossiers, safety data sheets, evaluation reports or substance data bases are needed to justify the exclusion of a hazard potential. If however no such conclusion can be drawn because the data are insufficient or contradictory then this is indicated by a question mark (“?”). Figure 2 shows the assessment rules and hazard exclusion criteria applied to the antimicrobial agent glutaraldehyde. According to REACH registration dossier the substance is properly characterized and not classified in respect to CMR effects & chronically toxic properties – so assessment number 1 is assigned to this hazard category. For all other categories H-statements or a combination of H-statements are used to assign assessment numbers. The assessment of surfactants without antimicrobial activity follows a streamlined procedure: First it is a priori postulated that surfactants pose no sensitizing, CMR or environmental harmful properties unless they are classified as such. So in case of no classification these hazard categories are not assessed – this is indicated by a white field and the entry “n.b.” which stands for nicht bewertet (i.e. not assessed). Additionally it is postulated that surfactants are consistently evaluated in respect to their toxic and irritating potential. In case the surfactant is not classified in this respect the categories Acute toxicity (respiratory tract) as well as Irritation and corrosivity are assessed with assessment number 1. For surfactants a question mark is only applied if there is reason to assume that a hazard potential does exist. The main purpose of the assessment procedure is the assessment of products, for this the assessment of ingredients is an essential prerequisite. The core element of the product assessment is a logarithmic scaling of the substance assessment numbers combined with a weighting with the concentration share. Logarithmic scaling means that the substance assessment number (ANo) becomes the exponent of the decadic logarithm and thereby generates a hazard factor according to the formula 10ANo. Weighting with concentration share means that the hazard factor is multiplied with the concentration share of the substance. Figure 4 exemplifies the algorithm which is applied to every ingredient including water: The product contains ingredient A with a high hazard potential (ANo 5) at a concentration of 0.1%. It further contains ingredient B with a low hazard potential illustrated by ANo 2 at a concentration of 10 %. For ANo 5 the logarithmic scaling generates a hazard factor of 100000, for number 2 the hazard factor 100 and for number 1 the hazard factor 10. The hazard factor is multiplied with the concentration share and the results are added up. The sum of 119 is a measure for the hazard potential of the product within the hazard category Acute toxicity (respiratory tract). This result is de-logarithmised to get a more suitable number for compiling a colour code. The colour code was chosen since colours can better convey the uncertainty owing to the assumptions made. 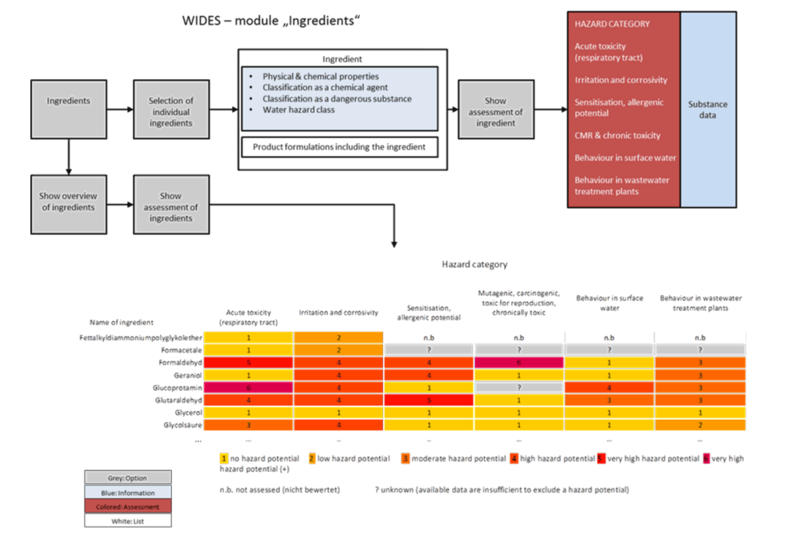 If one or more ingredients cannot be assessed and therefore carry question marks in the respective hazard category (see also Substance assessment) these are transferred into the colour field to preserve the information about data gaps in the product assessment. The WIDES assessment applies the correction factors Fhum and Feco derived from the vapour pressure to take into account the route of exposure. Fhum considers that volatile substances evaporate at the application site and may be inhaled but hardly enter the sewage. The factor weights volatile substances higher in the hazard category Acute toxicity (respiratory tract). Feco considers that non-volatile substances ultimately enter the sewage system, wastewater treatment plants and reception ponds or surface water bodies. Thus Feco weights low volatile substances higher in the hazard categories surface water bodies and wastewater treatment plants. We apply this concept on the example given in figure 4 and assume that ingredient A has a low vapour pressure of 0.01 hPa while B is considerable volatile with a vapour pressure of 260 hPa (figure 7). Weighting with Fhum decreases the product assessment number from 2.1 to 1.7 in the hazard category Acute toxicity (respiratory tract). 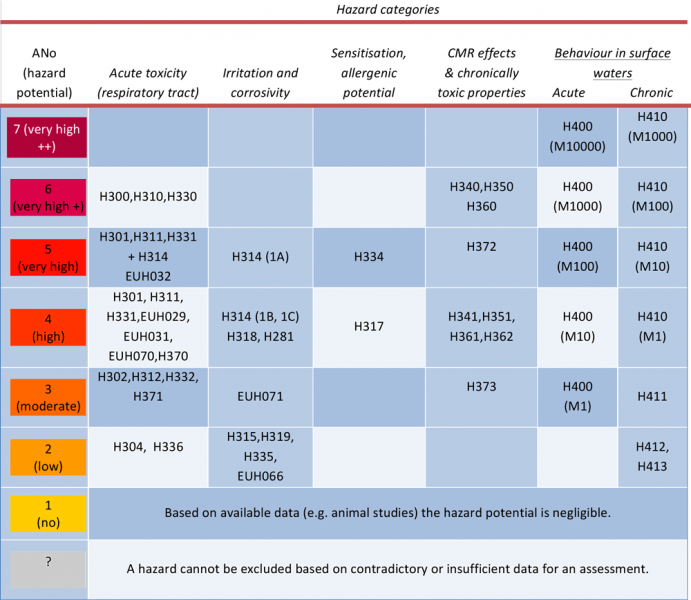 The hazard categories Sensitisation, Irritation and corrosivity as well as CMR & chronically toxic properties are not weighted due to the following reasons: i) in the hazard category Sensitisation the exposure is already adequately taken into account (sensitization by inhalation is more seriously assessed than skin sensitization); ii) no correlation between vapour pressure and a hazard potential could be found for the hazard categories Irritation and corrosivity and CMR & chronically toxic properties. An application solution is a dilution of a concentrate (trade product). The dilution of a trade product needed to achieve respectively ensure a defined antimicrobial efficiency is specified by the manufacturer. It therefore makes no sense to compare concentrates if the application solutions contain different quantities of a concentrate. For such cases the product assessment foresees a calculation step to take into account the dilution of the concentrate. This means that in case the products are applied without further dilution (e.g. rapid surface disinfection, hand disinfection) the WIDES assessment compares concentrates, in case that there is a dilution step the assessment compares application solutions. We assume that a product (concentrate) consisting of 10% ingredient A with a very high hazard potential and 10 % ingredient B with low hazard potential is diluted with water for wiping surface disinfection (figure 8). The manufacturer specifies the application solution to be a 1% dilution of the concentrate with water. Therefore the content of both A and B in the application solution drops to 0.1 % (figure 9). Calculating the product assessment number for the application solution gives 1.6. The outcome can only be compared to other application solutions but not to concentrates. Approximately one third of the products listed in the WIDES database are used as concentrates for fast surface disinfection, hygienic and surgical hand disinfection and skin disinfection. The majority of these products is classified as flammable and regularly contains alcohols in varying concentrations. For products in the named applications the corresponding hazard potential is assessed by means of the hazard category Flammability. In contrast to the assessment of the hazards for health and the environment, in this case only the products as such, not the ingredients, are subject to a two-tiered scheme. Basic assessment number and supplementary charges are summed up to a final assessment number Flammability. For the basic assessment the H- and R-phrases of the product are used, for the calculation of the supplementary charges physical properties designated in the product safety data sheet are relevant. Ignition temperature, flash point, lower explosion limit and explosion limit “modulate” the hazard determined by R- or H phrases, weighting them by adding supplementary charges. Thus a high ignition temperature (>300°C) reduces the overall hazard, while a low ignition temperature (< 200°C) increases it. Figure 10 shows an example for an assessment of a product which contains 26% ethanol and 45% 1-Propanol. The functionalities of the WIDES database can be accessed via the modules Ingredients and Products. Module Ingredients lists more than 200 ingredients of disinfectants, and includes published physical, chemical, human toxicological and eco-toxicological data and hazard statements of the substances. The ingredients are assessed according to the instructions given in the chapter Substances assessment. The substance assessment can be requested either for individual substances or as an overview list (figure 11). The module Products hosts more than 200 market-based products for hygienic hand wash, hand disinfection skin antisepsis, surface, instrument and linen disinfection with independently certified efficacy and with safety and product data sheets that fulfil sufficient quality criteria. The products are assessed according to the rules given in the chapter Product assessment taking into account all ingredients with hazardous properties at their specific concentration. The product assessment is always a comparative one and can only be requested if the following criteria are specified: i) field of application; ii) exposure time; iii) spectrum of activity. The WIDES database does not provide a product ranking, but rather an alphabetical list of suitable products. This list can be further processed by the users, allowing them to select the aspired hazard category and then generate a ranking by mouse click. Under the CLP Regulation, labelling and classification requirements are only triggered at generic concentration limits. For example, an ingredient classified as sensitising (category 1) is only mentioned on the label or the safety data sheet above a concentration of 0.1 %. Below a concentration of 1% the product is not classified and labelled as sensitising. But the WIDES assessment does not lose the classification and still takes into account low concentrations of highly hazardous ingredients in its product assessment. Safety data sheets provide no information about the hazard potential of aqueous solutions as diluted from the labelled concentrate. WIDES enables comparison of products taking into account the dilution processes and therefore points to the least hazardous final solution for the intended application. Fragrances classified as allergenic according to the Cosmetics Regulation are highlighted in the WIDES with a question mark in the hazard category Sensitisation, allergenic potential. The entries in the WIDES include the information if a product is labelled as being free of fragrances or perfumed. Actually efforts are made to equip the WIDES database with functionalities that support purchasing respectively the procurement of disinfectants.